Are you tight for space because the kitchen is too small? Are you a student with limited cooking facilities? Save your mornings people and make a complete breakfast with this family sized retro 3-in-1 Breakfast Station. Or whip up breakfast before your lectures and save money on eating outside. Make your morning wake up coffee whilst frying eggs and bacon and simultaneously making toast. It’s not just for breakfast though so don’t get stereotyped – get triply hyped. Every struggled with griddling your burgers and toasting the buns at the same time. Or toasting sandwiches without being able to see them cooking? Redemption is here. Big enough for four cups of coffee and a family sized griddle atop the toasting oven makes this a must-have retro breakfast station. Easy clean removable non-stick griddle will please college kids who don’t want to clean anything and coffee for their long nights studying or whatever. And the multi-purpose toaster oven has a timer so the lasagna won’t burn. 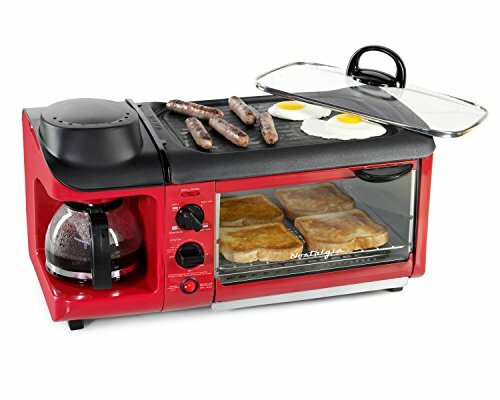 The retro 3-in-1 Breakfast Station is available in retro red or turquoise. A great space saving solution which would suit kitchens tight on space, student accommodation. Also good for office break counters for coffee and a quick lunchtime snack. Just take a look at this little baby…..
You can make your breakfast all at once with just this machine. Non-Stick so easy to wash and clean. Can replace a toaster, a coffee machine and also your pan! Space saving & ideal for small kitchens, students & snacks in the office. Compact size saves space and time.